Malaga Travel Tips – 16 unique and off the beaten track tips and travel ideas to help you discover what makes Malaga magnificent. 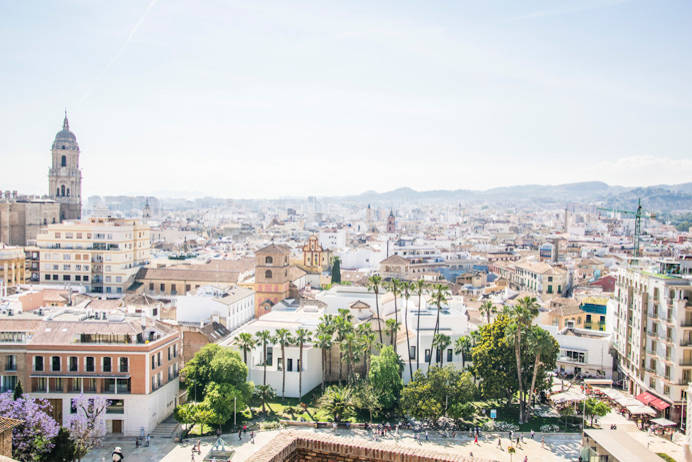 These Malaga travel tips will also help you get to know the locals and the places where they love to hang out. You’ll find most of Malaga’s urban street art, MAUS (Malaga Arte Urbano SoHo) in and around SoHo. If you are a fan of graffiti art, head to the MAUS website where you can download a map to find all the coolest murals. When you find the murals use your phone to scan the QR codes that tell you more about the art and artist. 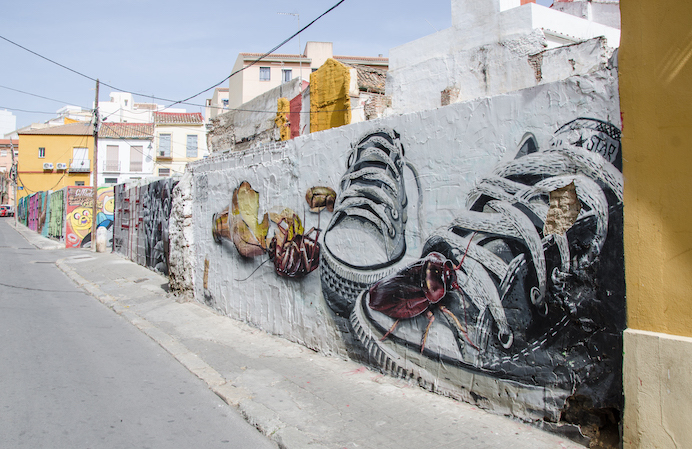 The Centro de Arte Contemporáneo is a great starting point for discovering the street art of Malaga. In El Tintero, the waiters walk around with an array of plates of food lined along their arms. The waiters shout out the contents of each dish and you raise up your hand and claim a plate when you hear something you like. But, you’ve got to be quick as the plates go fast. Most dishes cost the same price, but some dishes, like lobster, cost a bit more. Your bill is calculated at the end by adding up how many plates you had. This place is very lively so don’t go expecting a romantic meal. But it is a super fun way to sample traditional Spanish food and super fresh seafood. Get out into nature and mix and mingle with our feathered friends at the wonderfully peaceful Rio Guadalhorce Nature Reserve. You’ll find the Guadalhorce River Estuary Natural Area (Paraje Natural Desembocadura del Guadalhorce) on a naturally formed island. 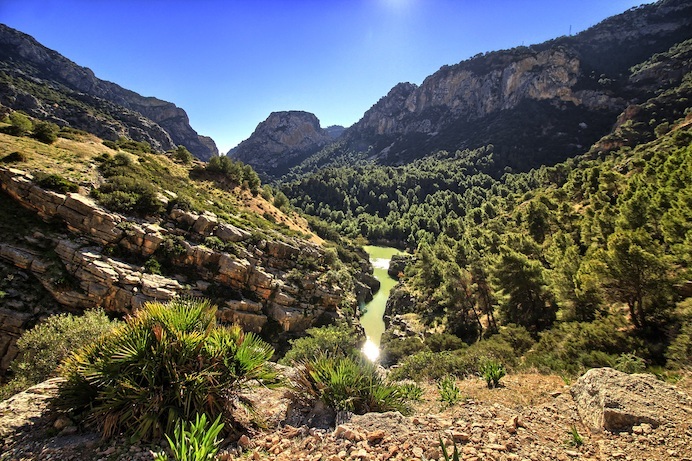 It is located where the Guadalhorce river flows into the Mediterranean. There are loads of rare birds to spot as well as plenty of flowers and mammals too. During the year you can spy birds like the glossy ibis, flamingo, spoonbill, black stork, Audouin’s gull and Caspian tern, and other more common ones such as Anatidae, terns or coots. Amongst the tamarisks you’ll also see white colonies of some Ardeidae. There are also birds that end their breeding season in the wetlands, such as the snowy plover. There is also a range of mammals, such as rabbits, foxes and otters; as well as reptiles, mainly chameleon; and flat fish and eels. Along this stretch of coast, the beaches are more like small coves and the breakwaters make for calm swimming. This stretch is less popular with tourists and doesn’t feel as crowded. When you need to cool down, be sure to get an ice-cream from Heladería Lauri. They only make ice-cream using organic and seasonal ingredients so each time you return there are new flavours to try. 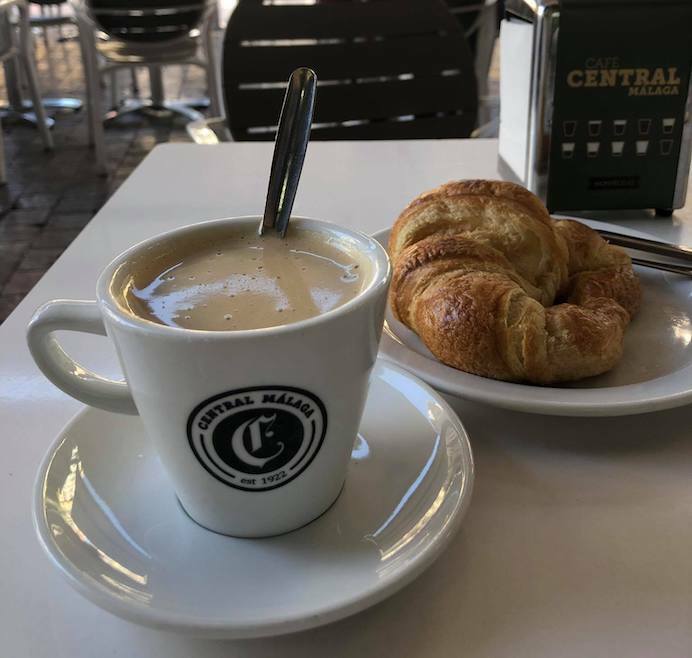 The Museo Picasso Málaga is one of the most popular places to visit in Malaga, but did you know that the patio in the Picasso Museum Malaga Café is one of the quietest places in Malaga city centre to have a coffee? You access the café through the museum’s bookshop, but you don’t have to be a visitor to the museum to enjoy the café. It is open to all. It’s located in the garden of the Palacio de Buenavista where bay trees, geraniums and orange trees grow. The tables all have parasols to protect you from the sun. The museum café is the perfect respite from a busy day in the city as it is so calm and tranquil. The menu features traditional tapas, like a crusty baguette with Serrano ham, tomato and olive oil. But, if you fancy something sweet, be sure to order a slice of the decadent red velvet cake. These can be washed down with excellent coffee or local beers and wines. 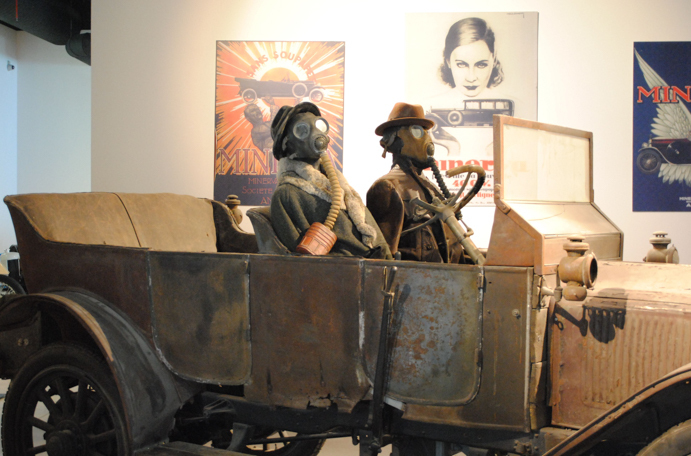 One of the best but less popular museums in Malaga is the Museo Automovilístico de Málaga. This is a car museum which is home to a private collection of around 90 classic cars, as well as, rather bizarrely, a display of haute couture fashion and hats. The exhibits are displayed across 13 thematic areas that describe the different styles from the late 19th century right up to modern times. There is an audio guide available to explain the exhibits in detail. It is a really fascinating museum and best of all, every Sunday at 12:30pm, you can experience the revving and roaring of some of the car engines. A must for all petrol heads. If you want a unique way to see Malaga, you can rent one of the classic cars from the Museo Automovilístico de Málaga. Choose from a selection of stunning classic motors and get out on the highway, looking for adventure. 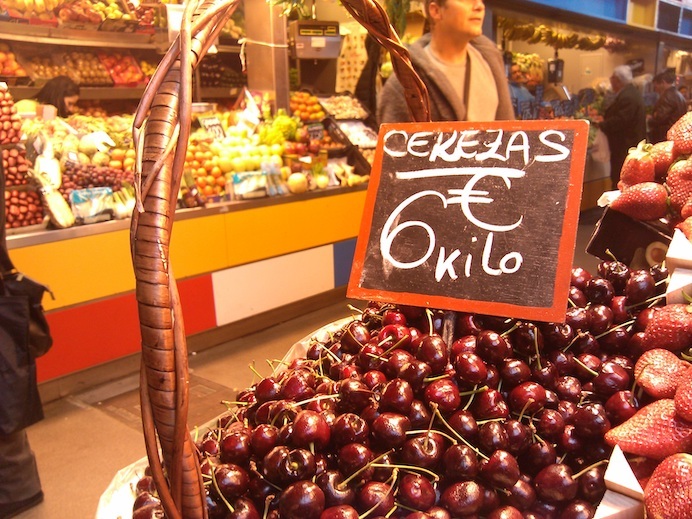 Mingle with chefs and restaurant owners in the Nuestra Señora del Carmen Market which is renowned for the high quality of its produce. Pick up some fresh fruit and be sure to try some seafood at Cafeteria Bar Mercado de El Carmen which is towards the back of the market and has great views of the old crumbling church. Travelling with kids? 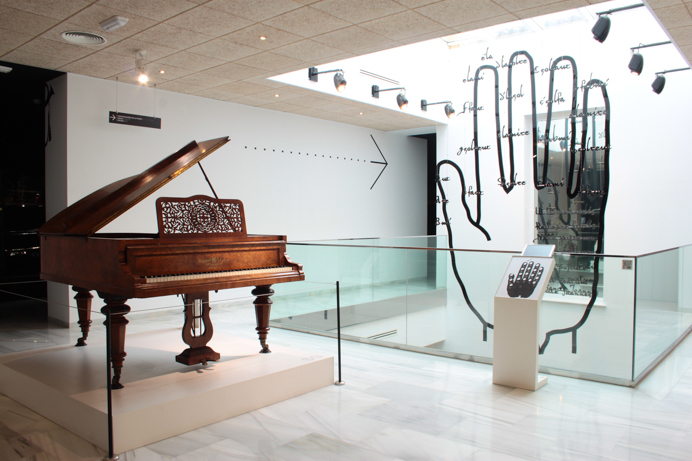 The Museo Interactivo de La Música (Museum of Interactive Music) is dedicated to music from around the world and is entertaining and interactive. The museum has an extraordinary collection of musical instruments from throughout the ages, which are very well displayed. There are interactive computer screens in each room so that you can learn more about the instruments and hear how they actually sound. You can then pick them up and start playing. Information is given in Spanish and English too. There is a lift to all floors and on the top floor are toilets and an outside roof terrace with a few tables and chairs and a vending machine for drinks. There is also a small gift shop selling a range of musically themed souvenirs. The Torcal de Antequera is characterised by a stunning Karst landscape, known as a terrain that spent more than 200 million years submerged by the sea. Here you can marvel at the magnificent and strange rock formations and search for fossils. It is best to come early morning or late in the evening to beat the heat and crowds. There is a lookout too which is wheelchair accessible. Just be responsible and don’t touch or remove any fossils or rocks. 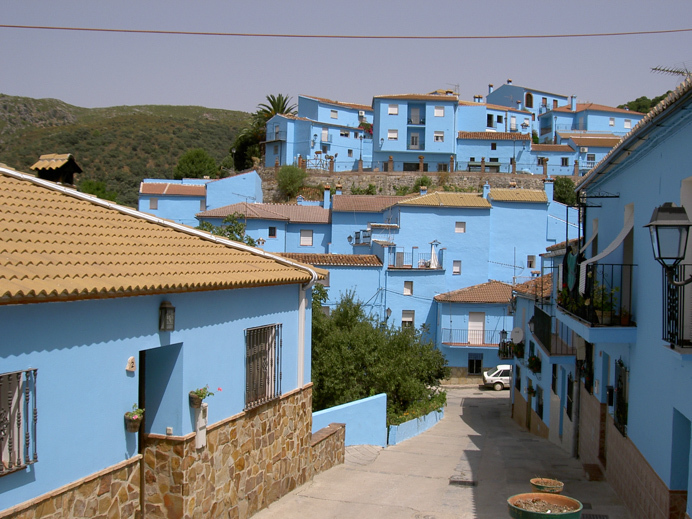 A few years ago the village of Júzcar was painted blue to promote the Smurf’s movie. However, the residents loved the new hue so much they have left the village blue and dedicated to the Smurfs. The village of Júzcar is now a real-world Smurfville. The houses and buildings are painted blue and white, there are Smurf-themed street art and murals, and smurf ornaments and decorations. There are even giant-sized smurfs dotted about the place. To get here you can drive, take a train or catch a bus from Malaga city centre to Júzcar. Once here, you just roam the blue streets and take in all the smurf-ness. For the best views, head to the mirador. You can’t miss it. It is marked by a giant Papa Smurf. 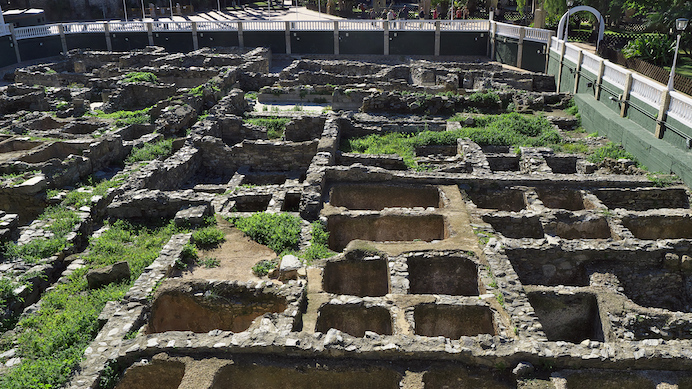 In the Parque Botánico El Majuelo, you’ll find the 2,500-year old El Majuelo Ruins of what once was a thriving fish factory. The ruins are very interesting and striking looking. When you visit the park, find the shed where the guitars are made and watch as guitars are handcrafted. You can also book guitar lessons too and if you are lucky you’ll hear one of these masters play some traditional music. Not only is Museo Flamenco Peña Juan Breva a great place to learn about Flamenco but you can catch a flamenco show for free on Friday evenings at 10.30pm. 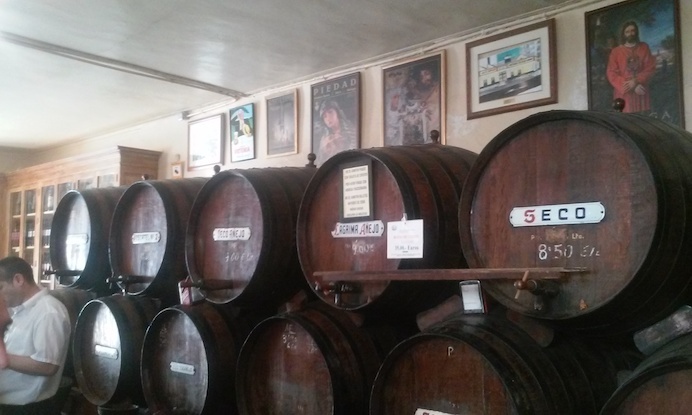 Open in 1840, Antigua Casa de Guardia is the oldest wine bar in Malaga and one of the best places to try excellent Spanish wines and sherry. There are no chairs or tables or wi-fi, you just prop yourself up against the bar and order your drink. The numbers that you see written in chalk on the barrels is the price of the drink and your drink is poured directly from the barrel. It is a great experience. Top tip is to order the potent homemade vermouth or a glass of Moscatel. Make like the locals and order oysters to go with your vermouth. Cafe Central in the heart of old town Malaga is one of the oldest cafes in the region. It is full of traditional charm and a great place to people watch. It is also the birthplace of the local coffee ordering lingo. There are 10 different ways to order coffee. 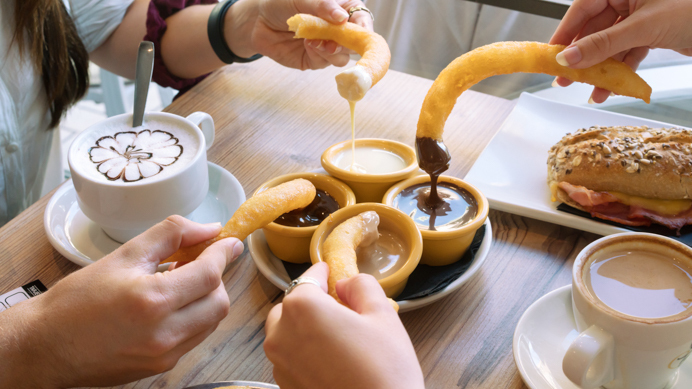 Decide which of the 10 coffees you would like and order it with a portion of churros. The best time to come here is around 11am when the locals call in for their ‘second-breakfast’. Malaga has its over version of Churros, the popular long sugary doughnut from Spain. Called tejeringos, they are smaller and thinner and are fried in a circle. The best place to try these sugary treats is in Tejeringo’s Coffee Malaga. This café is legendary and super popular with the locals. Make like the locals do and order them with a hot chocolate. You then drunk the tejeringos into your hot chocolate. class=”s1″>In Tejeringo’s Coffee, you can choose from four dipping sauces; chocolate, white chocolate, Kinder and dulce de leche. Feeling wild? Get all four! The best time to come here is early in the morning or later in the evening as this is when the crowds have died down. But the tejeringos in Tejeringo’s Coffee are worth queueing for. Just ask the locals. Have you been to Malaga? What did you think of it? 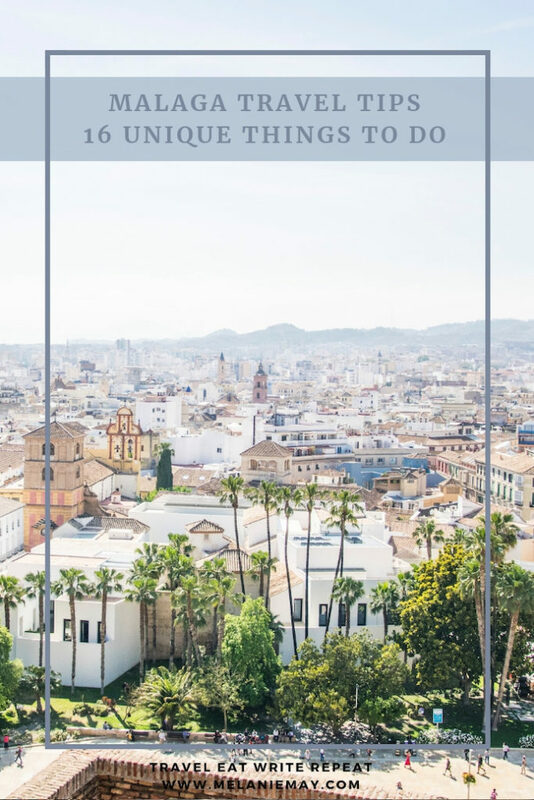 Are there any magnificent Malaga travel tips that I should add to my list? Let me know in the comments below. If you liked this Malaga travel tips blog post, you might also like my Bordeaux travel tips blog post. 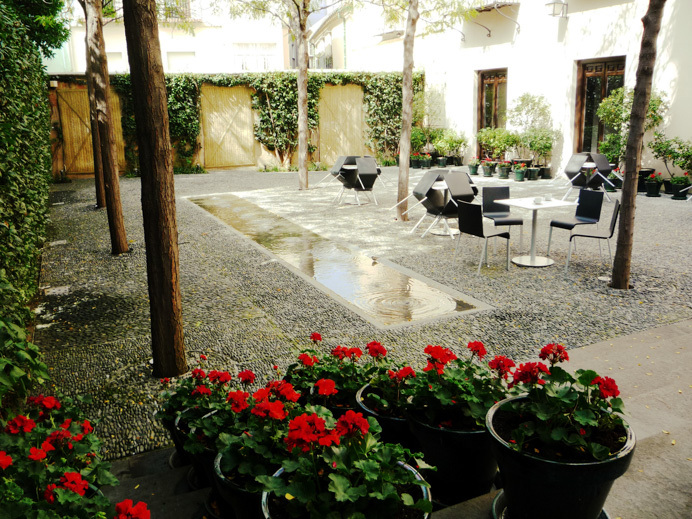 And check out my Madrid travel guide. If you liked this Malaga travel tips blog post, please share with others.